This weekend marks the kick-off of grilling season, so I began to ponder the idea of grilling grass-fed burgers for our Memorial Day Barbecue. I have to be honest, in many ways, meat, especially red meat, is unchartered territory for me. I was almost 30 when I had my first hamburger as an adult. My husband made it for me and I thought it was the second best animal product I had tasted – right after bacon. Grass-fed beef, however, takes some getting used to, especially for Generation X. The truth is grain-fed beef is all we’ve ever known. There was a time when beef was as seasonal as produce – the flavor changed as the landscape did. Animals were slaughtered at the peak of their ample, but slowly fattened waistlines, which was dictated by the seasons and stages of pasture. While the use of railroads and improvements in refrigeration both contributed to beef becoming less seasonal, little contributed more than post-World War II grain surpluses. Because of the surplus, farmers could fatten cattle faster with less expense and practically eliminate reliance on grass-growing seasons. The result is grain-fed beef. Social, health and animal husbandry reasons for choosing 100% grass-fed beef over commercial grain-fed beef are well documented. Convincing God-fearing, beef eating, Nebraskans that grass-fed beef is better for the cow is one thing, that its better for the grain fed-trained palate is quite another. Hopefully, this grillers guide to grass-fed beef will convince you to give grass-fed hamburgers a try, or as my grandmother would say, hamburgers. You aren’t crazy if you’ve tried grass-fed beef and didn’t like it. Think of it like grapes and wine – the flavor of the wine varies with the type of grape and the region in which it is grown. The flavor of beef varies with the genetics of the animal and the pasture they consume. 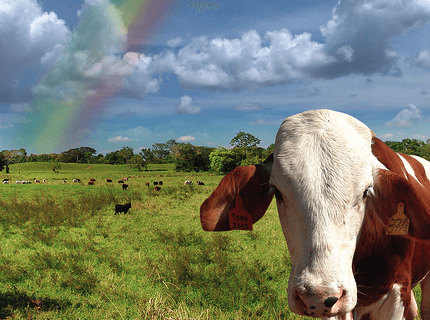 The key to finding grass-fed beef you enjoy is to find a producer you like. James Beard Award Winning author Deborah Krasner breaks down the nutritional benefits of grass-fed beef verses conventional beef in her beautifully detailed book, Good Meat: The Complete Guide to Sourcing and Cooking Sustainable Meat. According to her research (and that of many others) grass-fed beef is leaner, has fewer calories and is lower in cholesterol than conventional beef. It also has higher levels of Omega 3 fatty acids and contains Conjugated Linoleic Acid (an antioxidant), and vitamins A and E.
Before building the perfect grass-fed burger it’s important to note the fat to meat ratio, which for grass-fed should be 80 or 85 to 20 or 15, meaning 80 or 85 percent meat to 20 or 15 percent fat, any leaner is too lean. Matt Parks, head chef at Dolce, serves Range West Grass-fed Beef and recommends the home cook seek out ground beef with a larger grind. “The meat to fat ratio and the size of the grind can really impact the texture and moisture content of a burger,” he said during a phone interview. So what should you do with this pastured wonder-beef once you’ve purchased it from a local producer and brought it home? It’s simple; you cook it really slow or really fast. Folks who love their burgers brown will be sad to hear you should eat grass-fed ground beef rare to medium rare – that’s when it’s at its best. Grass-fed ground beef should be quickly seared on the outside leaving the beef rare or medium rare on the inside or, according to Krasner’s book, “cooked very slowly to a more advanced state of doneness.” If you would like your burger more brown than pink, cook it over low heat for a longer period of time. Krasner’s burger recipes sear “very rare” burgers for 2 minutes per side on high heat, for medium rare burgers cook on low heat for 4-5 minutes per side. These guidelines are important to keep in mind when ordering grass-fed burgers at a restaurant as well. If it only takes 10 minutes from the time you order it to the time you get it, chances are it won’t taste very good. Do everything you can to keep the moisture in the burger – don’t pierce it with a fork or smoosh it with the back of your spatula. Leave it be. Finally, be judicious with the amount of salt you use and how you use it as it can draw moisture out of the meat. In the Omaha area Range West Beef, Pawnee Pride Meats and Thistles and Clover are three well-known producers. You can also search via local food websites such as the Nebraska Food Co-op (http://www.nebraskafood.org/), Local Harvest (http://www.localharvest.org/) and Local Dirt (http://localdirt.com/) or visit Tomato Tomato (http://www.tomatotomato.org/), an indoor farmers market or visit one of the area’s outdoor farmers markets where many vendors also provide samples. Finally, like any restaurant menu would advise, “The consumption of raw or undercooked eggs, meat, poultry, seafood or shellfish may increase your risk of food borne illness,” but this is America, so its up to you.